Today we explored pumpkins. We talked about their characteristics (orange, hard, smooth), then opened them to see what was inside. The kids enjoyed their sensory time, digging the seeds out of the pulp and washing them. After nap time, we baked the seeds for a snack. We kept a few seeds raw and planted them in a mason jar to watch them grow. We also baked the meat of the pumpkin, which we plan to use for muffins this week. We're still having beautiful fall weather so the kids have also spent a lot of time outside. Our neighbor gave us two sunflower heads to extract the seeds from. The kids really enjoyed the process. We're hoping to plant a few next spring. We had our weekly socialization time in the morning and then Dragonfly and I worked on her science notebook. She practiced following directions by coloring the parts of the pumpkin life cycle the correct colors. The file for the pumpkin life cycle can be found here. Daddy was home today for a wisdom teeth extraction. The kids played outside a lot and I line dried clothes. 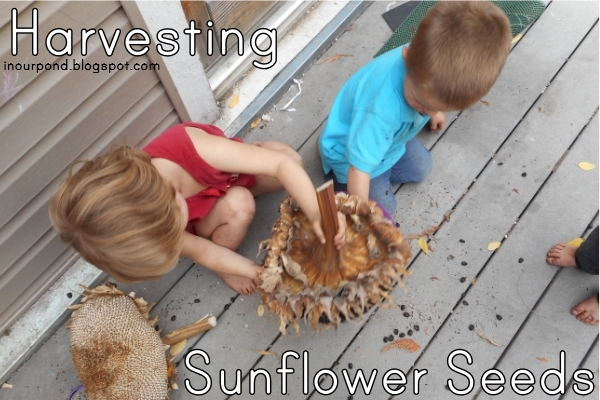 We watched this neat Youtube video of a sunflower growing through its life cycle. Daddy was home, and it was like a holiday for the kids. We also saw the first shoots of our pumpkin seeds today. "How Many Seeds in a Pumpkin"
WOW! My kids are going to love this work next year.Thank you so much for linking up at the Learn & Play Link Up. Your post is featured this week on Christian Montessori Network! Glad you enjoyed my post and find it useful. I forgot to add to the post that we spend time focusing on all the kinds of seeds we can eat (beans, nuts, fruits, rice, etc). I do hope your kids find lots to do with this theme.